Carcassonne hosts several major events each year. Festival de Carcassonne is one of France’s largest festivals, offering theatre, circus, opera, classical music, dance and concerts throughout the city. 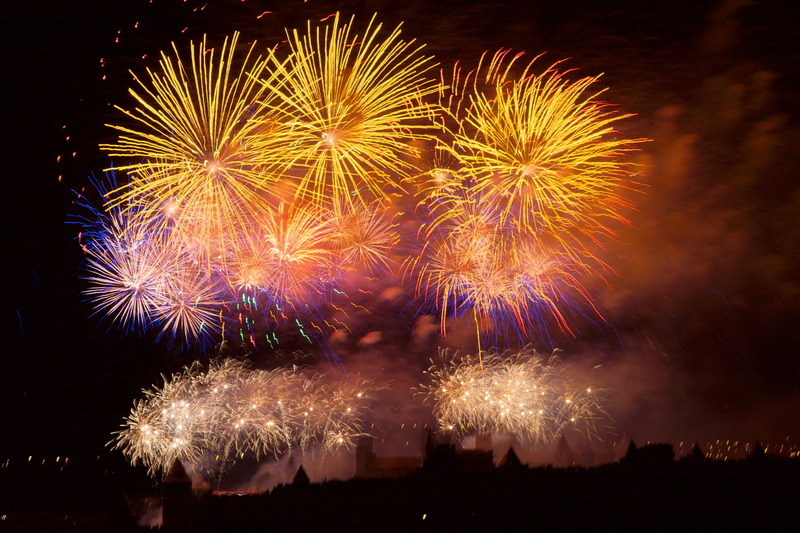 Every Bastille Day, Carcassonne puts on one of the largest fireworks displays in all of Europe, called Carcassonne Ablaze. Over 700,000 visitors crowd together on the banks of the Aude to watch this incredible event. Every year, the Tour de France bicycle race comes within an hour’s drive of Carcassonne. The Tour is a hugely popular event in France – imagine if the SuperBowl lasted for 21 days! Precise route is usually announced in January. The Feria de Carcassonne is a festive event with groups performing salsa, flamenco, Occitan music, tango, accordion, banda and brass band music in the streets with Seville-style dancing and popular singers! Carcassonne switches on its lights and dons its winter coat, from the Bastide St Louis to the Medieval City, to offer you the best of Christmas with exciting attractions, concerts, street entertainment and magical decorations and lights. Ice-rink, Christmas market, giant revolving eye, toboggans and roundabouts, all with a host of live shows. The Aude Tourism Office compiles a large listing of events in Carcassonne, plus additional events in neighboring towns.